Jung-sook will be the chief guest at ‘Deepotsav’ event and at the ceremony which commemorates Heo Hwang-ok, the Indian wife of Kim Su-ro, the founding king of Korea’s Gaya Kingdom. South Korea First Lady Kim Jung-sook arrived in Lucknow on Monday evening on a four-day visit to Uttar Pradesh. She was received at the Chaudhary Charan Singh International Airport at Amausi by senior state government officials. Jung-sook will be the chief guest at “Deepotsav” event being organised by the Uttar Pradesh government, and at the ground-breaking ceremony which commemorates Heo Hwang-ok, also known as Empress Heo, the Indian wife of Kim Su-ro, the founding king of Korea’s Gaya Kingdom. The four-day trip will be the first time in 16 years that a South Korean First Lady would be travelling to a foreign land without the President. 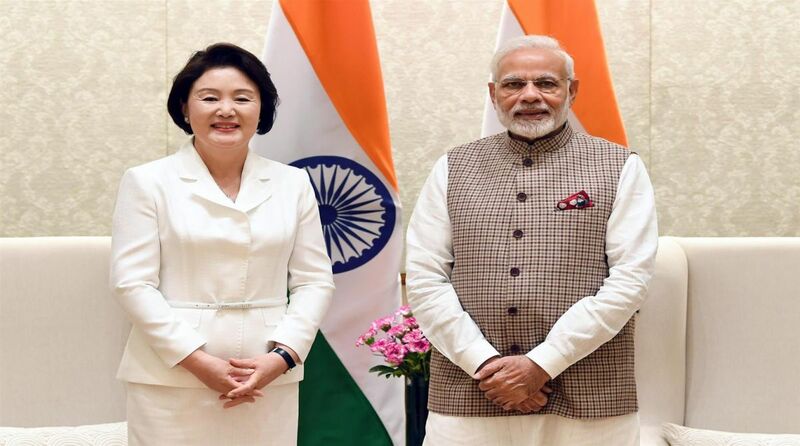 Earlier on Monday, Jung-sook met Prime Minister Narendra Modi. “In their meeting today (Monday), Modi and Jung-sook discussed the deep civilisational and spiritual links between India and Korea, and exchanged views on promoting people-to-people exchanges,” an official release said. “The Prime Minister warmly recalled the successful visit of President Moon Jae-in to India in July this year which imparted fresh momentum to India-South Korea Special Strategic Partnership,” it said. The trip follows a state visit that President Moon and the First Lady had made to India in July. At that time, Modi asked South Korea to send a high-level delegation to the ground-breaking ceremony and the festival to celebrate the cooperation and history between the two countries.